STATFORD Upon AVON....This place is just exactly what you would hope it to be. It is a quiet little village along the Avon River. And, so many of the buildings date back hundreds and hundreds of years. 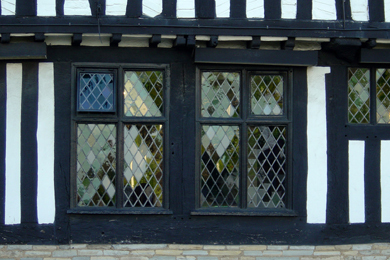 Of course, a whole industry has developed because Stratford was lucky enough to be the home of William Shakespeare. 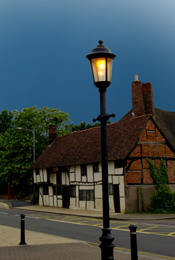 The village was a bustling market town when the bard was born there in 1564. And now, half-timber homes have been preserved, English gardens have been manicured, and actors have rehearsed for an entirely different kind of market. There is a list of "must-see" things to do in and around Stratford upon Avon. 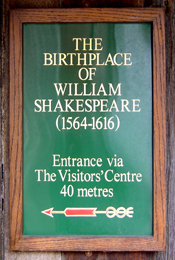 Of course, you must see William Shakespeare's birthplace, his wife Anne Hathaway's cottage, his daughter Susanna Hall's home, his grand-daughter Elizabeth Nash's home, and Trinity Church where the whole lot of them are buried. And, if you go to Stratford, you must see something performed by the Royal Shakespeare Company. Side trips from Stratford should include Warwick Castle and the Globe Theater in London.